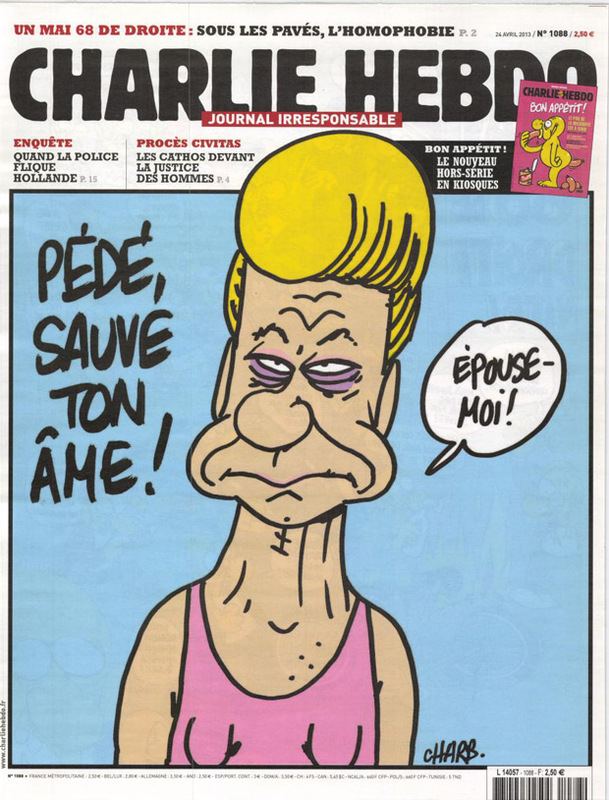 Today we are publishing work from the satirical magazine Charlie Hebdo as part of a global action in a signal of solidarity with the French publication, which came under such deadly attack yesterday. The joint action also underlines the commitment of authors and journalists around the world to state their commitment to freedom of expression and its vital importance. We stand together for the right to mock, to caricature, to argue, debate and offend. We believe that only through solidarity – in showing that we truly defend all those who exercise their right to speak freely – can we defeat those who would use violence to silence free speech. 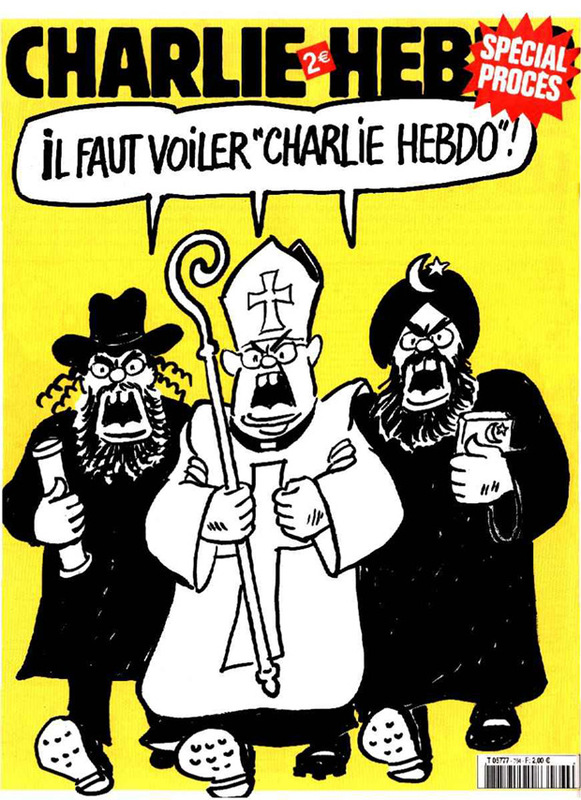 We have selected 12 cartoons from Charlie Hebdo that reflect the broad sweep of its satire, which ranges from politics, to immigration, to religion*. 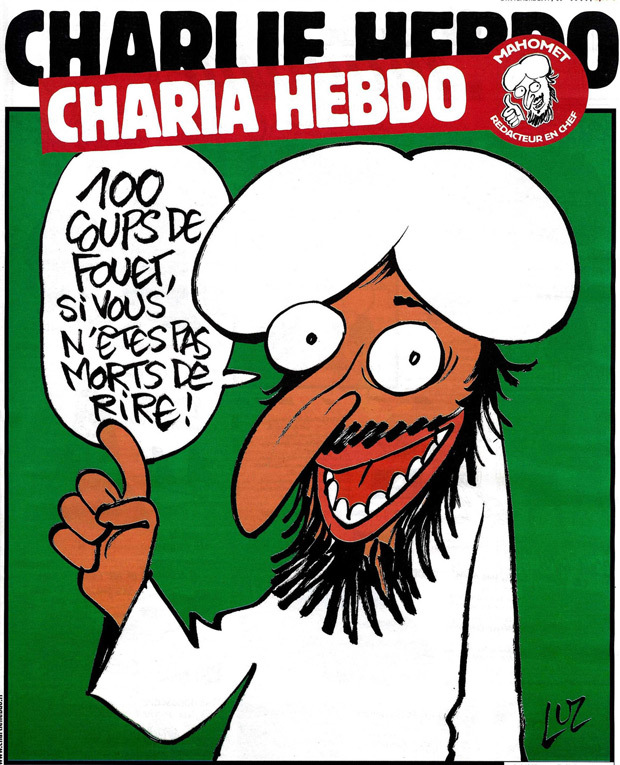 As part of the joint action, publications are selecting a cartoon, a range of cartoons, or covers that they believe best reflect the work of Charlie Hebdo. The idea is a moment of unity in which we show that together we stand up for journalism and the right to free speech, no matter what, and to show our support and respect for those killed on January 7. 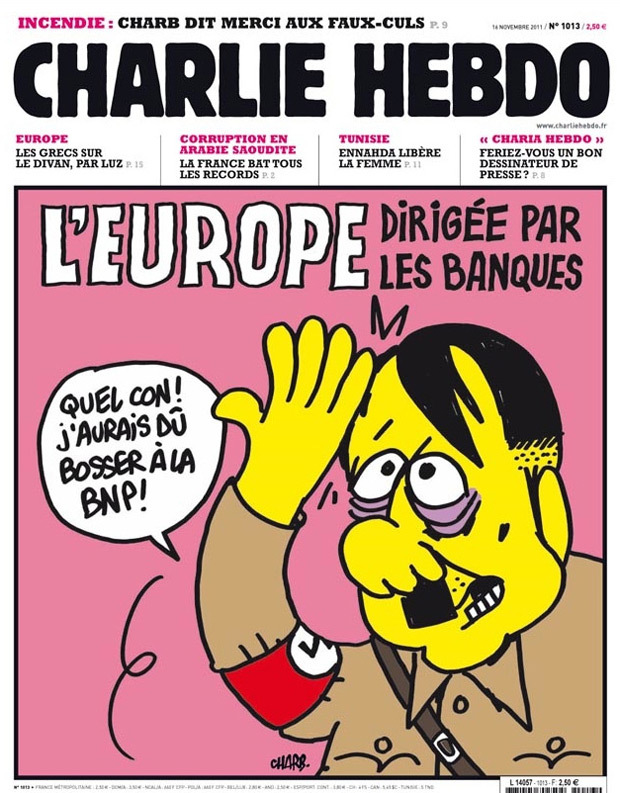 Many organisations and individuals have already posted a number of the Charlie Hebdo cartoons, including Berliner Zeitung, Buzzfeed, The Daily Beast, Fox News, and The Times of London. 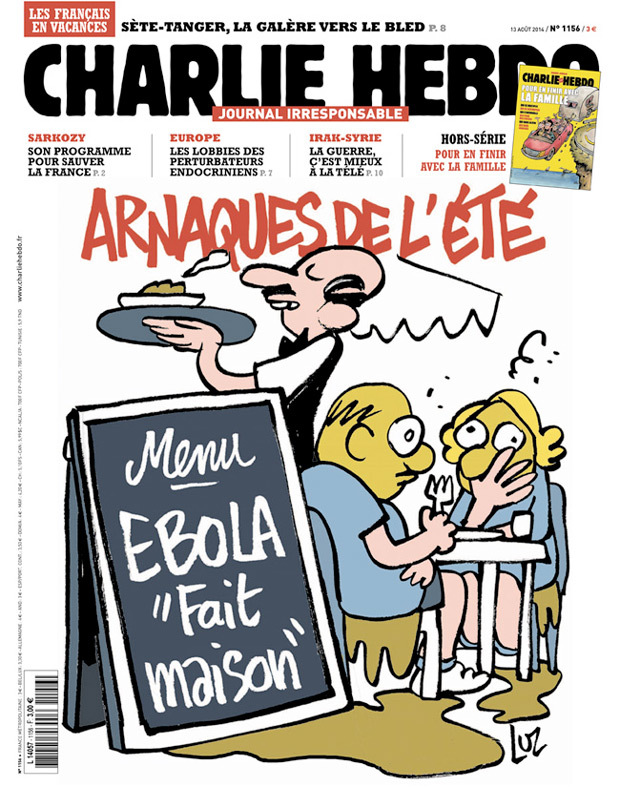 Some reflect the wide variety of satirical content of Charlie Hebdo, others focus only on those related to Islam. 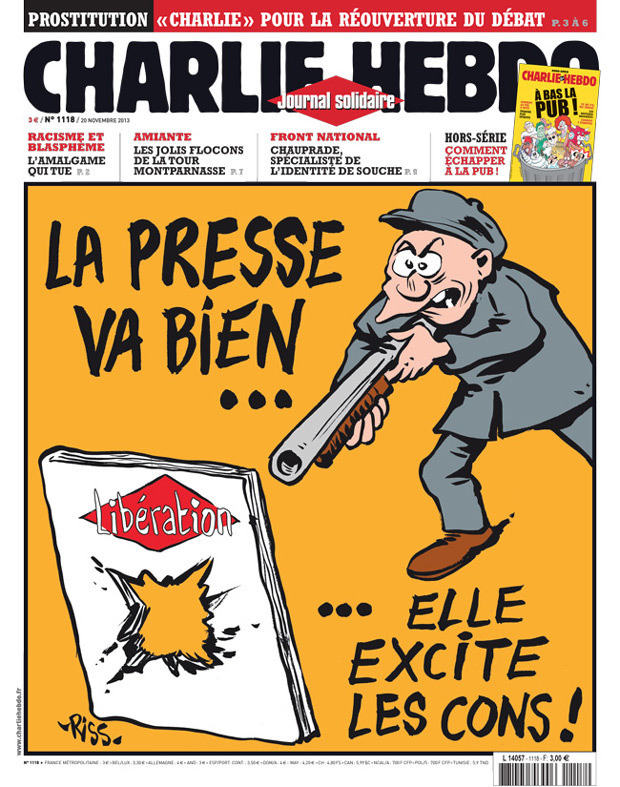 Our own aim is to show that fear should not be allowed to stifle free expression, and to reflect the full range of Charlie Hebdo’s work. You can see the joint statement on the action here. Over the past decade it has often been left to small individual publications to take a strong stand on freedom of expression incursions. This global action is a way of showing it is not just one publication or author that stands alone. For those over the years who say they support freedom of expression but with opt outs, or who have argued that freedom of expression doesn’t extend to articles, photographs or cartoons which offend them, it should be made clear that freedom of expression gives everyone the chance to debate opinions, and that right is vital. If we stopped writing or broadcasting about every issue that someone found offensive then the newspapers and television news would be empty of subjects. We would know nothing, and we would have no way of knowing what others thought. 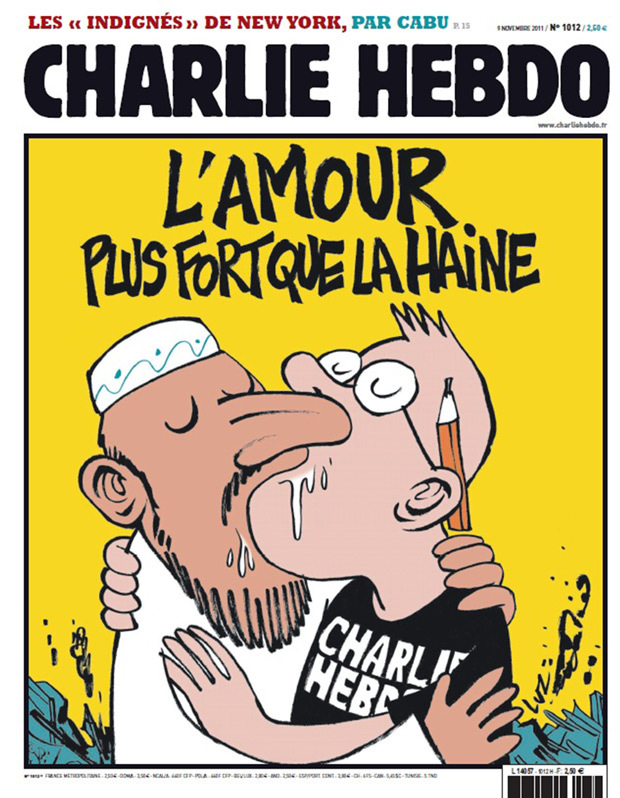 As John Stuart Mill wrote in On Liberty: “If all mankind minus one, were of one opinion, and only one person were of the contrary opinion, mankind would be no more justified in silencing that one person, than he, if he had the power, would be justified in silencing mankind.” Let our response to the attack on Charlie Hebdo not be silence. Two men in Britain were jailed for distributing my cartoons mocking the cult of Holocaustianity. I could never get Index on Censorship interested in their case or in my “Tales of the Holohoax” cartoons.